The addition of trumpet sleeves instantly gives the Anne Boleyn gown a regal air. The moment I slipped the bodice on, my shoulders rolled back, my chin lifted, and I found myself using the queenliest expressions as I promenaded throughout my apartment, fabric swinging beautifully about my arms. I become increasingly thrilled with each component added. 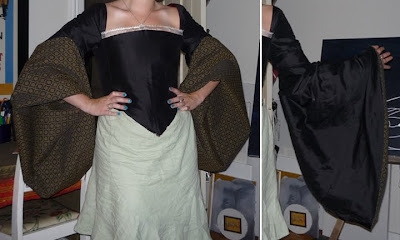 The weight of billowing trumpet sleeves certainly pulls the bodice to a different position, up and to the side, though the skirt’s volume should bring things back in place. The contrasting fabric is actually sewn to the upper sleeve lining, which is revealed as it flips back. Tonight I start the skirt, and one can only imagine what the addition of all that fabric will do to the overall character of the gown.